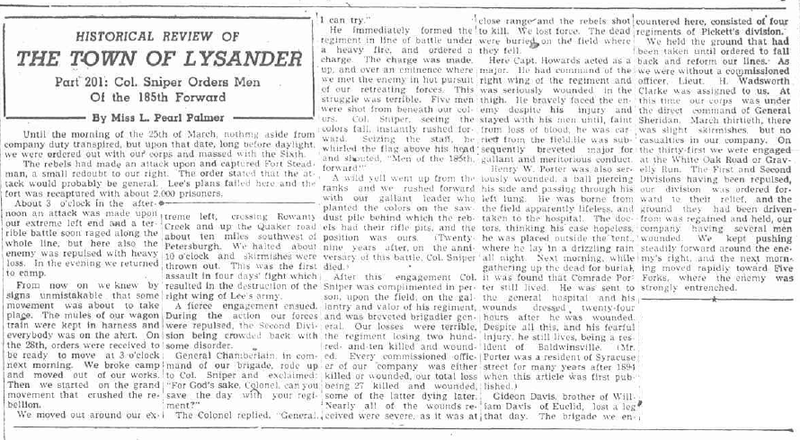 Editor’s Note: In the mid-1940’s the Baldwinsville (NY) Messenger reprinted a lengthy series of articles on the 185th New York and other New York Civil War units from 50 years earlier, originally published in the Baldwinsville Gazette, which detailed the history of the town of Lysander, New York. This article is one part of a sub-series in this set detailing the 185th New York and its experiences at the Siege of Petersburg. I found these articles while searching through the always fascinating Fulton NY Postcards site. This article was transcribed by Jackie Martin. Until the morning of the 25th of March , nothing aside from company duty transpired, but upon that date, long before daylight, we were ordered out with our corps and massed with the Sixth. From now on we knew by signs unmistakable that some movement was about to take place. The mules of our wagon train were kept in harness and everybody was on the alert. On the 28th [of March 1865], orders were received to be ready to move at 3 o’clock next morning. We broke camp and moved out of our works. Then we started on the grand movement that crushed the rebellion. [On March 29, 1865] We moved out around our extreme left, crossing Rowanty Creek and up the Quaker road about ten miles southwest of Petersburgh. We halted about 10 o’clock and skirmishes were thrown out. This was the first assault in four days’ fight which resulted in the destruction of the right wing of Lee’s army. A fierce engagement ensued. During the action our forces were repulsed, the Second Division being crowded back with some disorder. After this engagement Col. Sniper was complimented in person, upon the field, on the gallantry and valor of his regiment, and was breveted brigadier general. Our losses were terrible, the regiment losing two hundred-and-ten killed and wounded. Every commissioned officer of our company was either killed or wounded, our total loss being 27 killed and wounded, some of the latter dying later. Nearly all of the wounds received were severe, as it was at close range and the rebels shot to kill. We lost force. The dead were buried on the field where they fell. Here Capt. Howards acted as a major. He had command of the right wing of the regiment and was seriously wounded in the thigh. He bravely faced the enemy despite his injury and stayed with his men until, faint from loss of blood, he was carried from the field. He was subsequently breveted major for gallant and meritorious conduct. Gideon Davis, brother of William Davis of Euclid, lost a leg that day. The brigade we encountered here, consisted of four regiments of Pickett’s division.